To have ambitious dreams and make them come true is difficult. But there is something even more difficult: to have ambitious dreams and not make them come true. 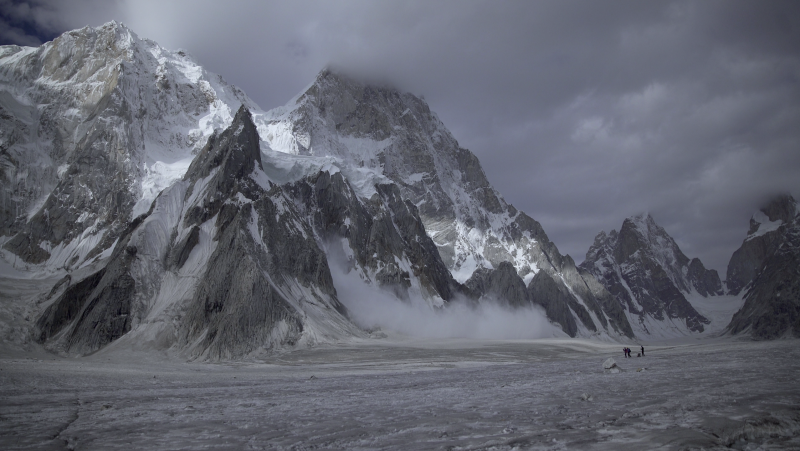 The huge mountains of the Karakorum have a particular charm, which is due largely to their extreme isolation, to the taste of adventure and the opportunity of first ascents which bring goose bumps. They have many legendary names, evocative, mysterious, the Trango Towers for example: the Monk, the Pulpit, the Castle, the Nameless Tower. 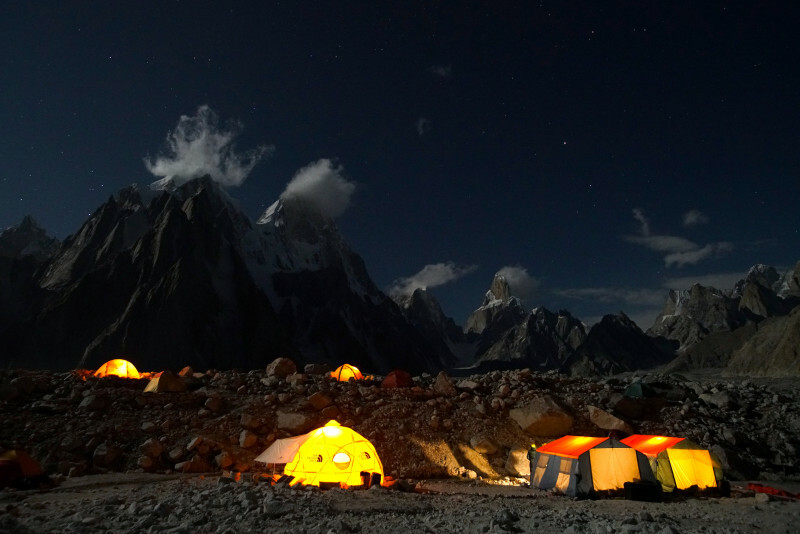 Even their appearance takes your breath away: Laila Peak resembles a spear stuck in the sky, the Masherbrum is such a perfect pyramid that it seems sculpted by titanic hands. 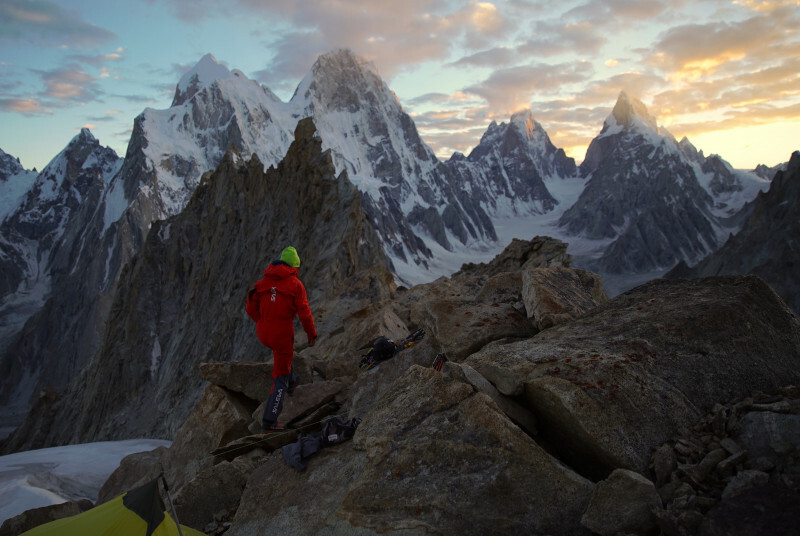 The mountains of Karakorum, when you see them, are etched in your memory. The valleys which run up from Askule to Latok’s base camp seem carved out with a chisel both down low, where these is still space to cultivate, and up high, where it is weather beaten and there is only naked scree: grooves obtained by very high and clear cut rock faces, with impetuous torrents running through them, paths on which even mules with the steadiest step move backwards. Four tiny figures, quickly and teetering climb up the valley of Choktoi, trudging under the weight of all the gear needed for a long expedition. It is Simon Gietl, Thomas Huber, Yannick Boissenot, and Rainer Treppte. 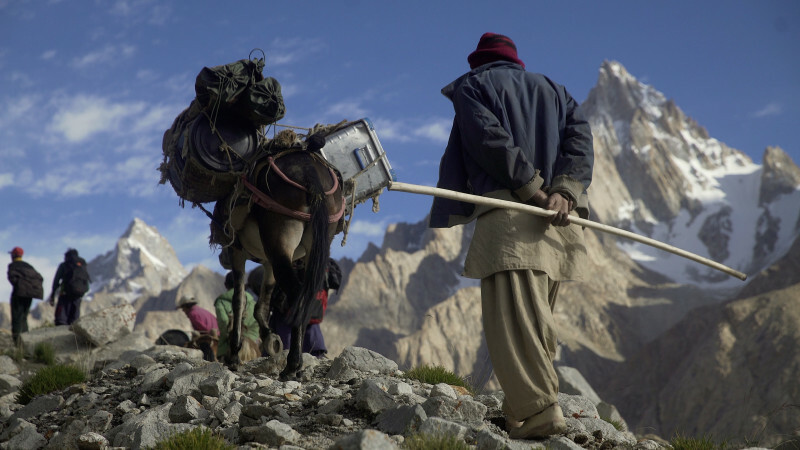 The destination is Latok I: a remote mountain, difficult and beautiful. Thomas has already been in its vicinity twice before, in 2015 and in 2016, without reaching its summit. 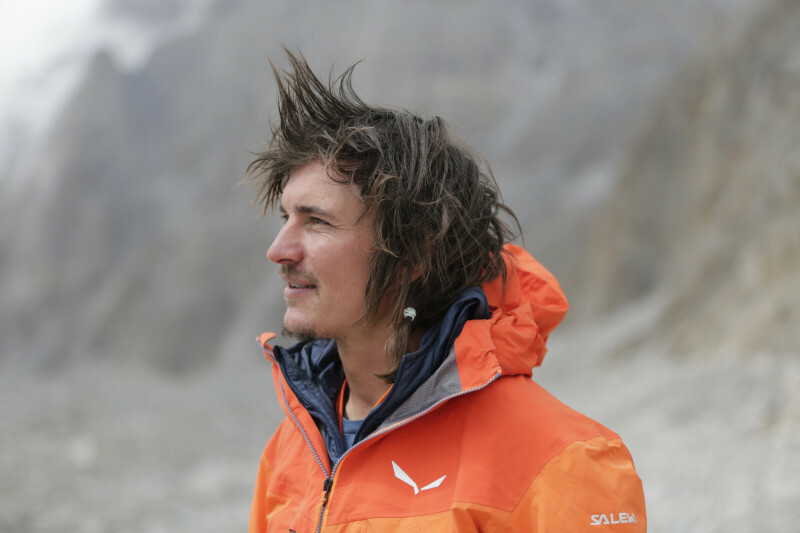 This is a part of the world which the legendary German climber knows very well: the first ascent of Ogre III and the second ascent of Ogre, peaks which are not distant, carry his name, for example. Instead it is the first time for Simon Gietl in Pakistam. Life is funny sometimes: you fall in love with a place which you’ve never seen before and have only read about in a book, and then you find yourself exploring it with the person who wrote that book. Yes, that’s exactly how things went, this is the way in which the mountains of Latok etched themselves in the memory of Simon: it was at the beginning of the year two thousand and the South Tyrolean had just discovered his endless love of climbing by chance, thanks to an anonymous alpinist who had picked him up while he was hitch hiking from Brunich to Doblach. After the first few ascents he was already curious of seeing what it was like to climb during winter, and there he was engaged with a colleague on the Abram arête on the Sella rocks. The result was not at all gratifying: ten days in hospital with the early stages of frost bite on his toes and fingers. A lot of free time, spent staring at the ceiling, or else, better still, reading a book. And that book, given to him by his father, was in fact Ogre, by Thomas Huber. The four tiny men amidst the colossal and remote mountains, reached their destination: a wide glacial basin at 4300 metres above sea level, from which, thanks to the high pressure and air as clear as glass, made it seem possible to touch the peak of Latok I with a finger. Everything around has the grey and white silence of ice and granite. The time has come to start acclimatizing, before the challenge: yes, because the challenge is anything but simple. 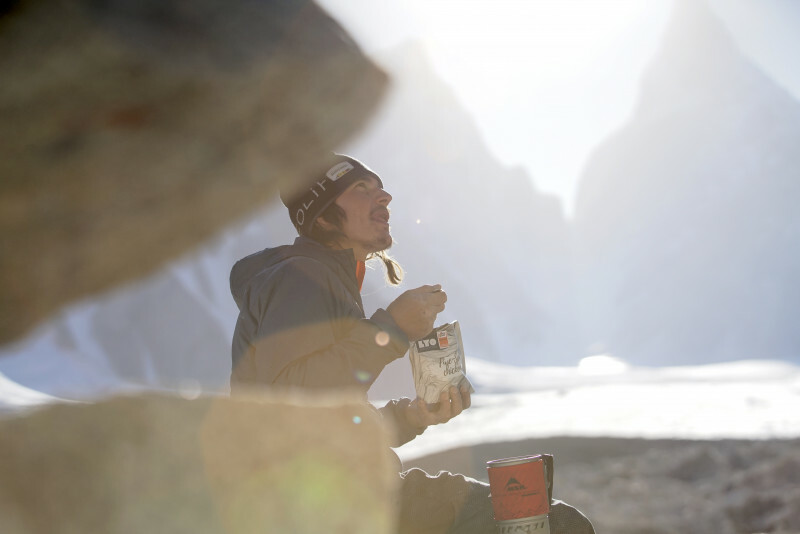 It is forty years that nobody has climbed Latok I, and nobody has ever been up its north face. 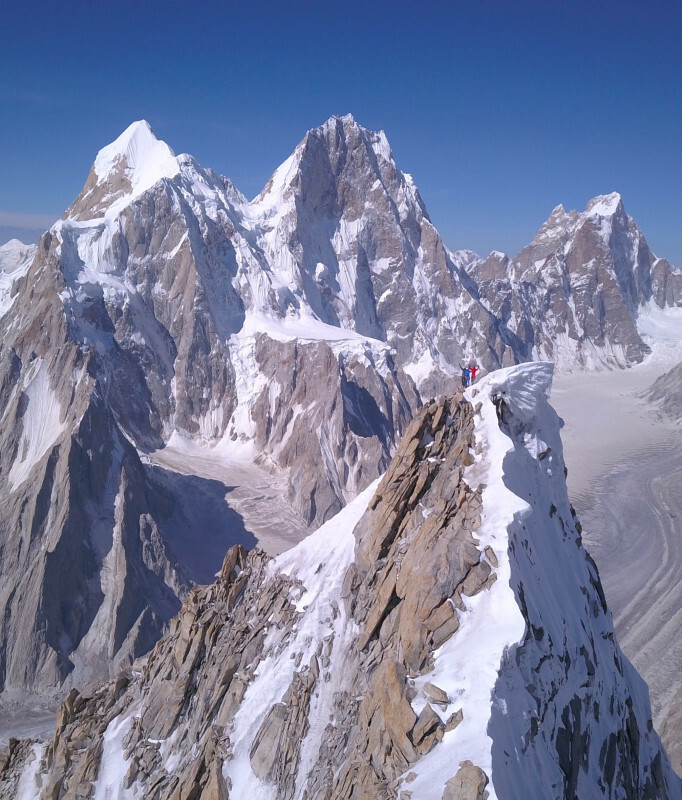 That ridge, long and extremely technical, is one of the greatest problems in the Karakorum. 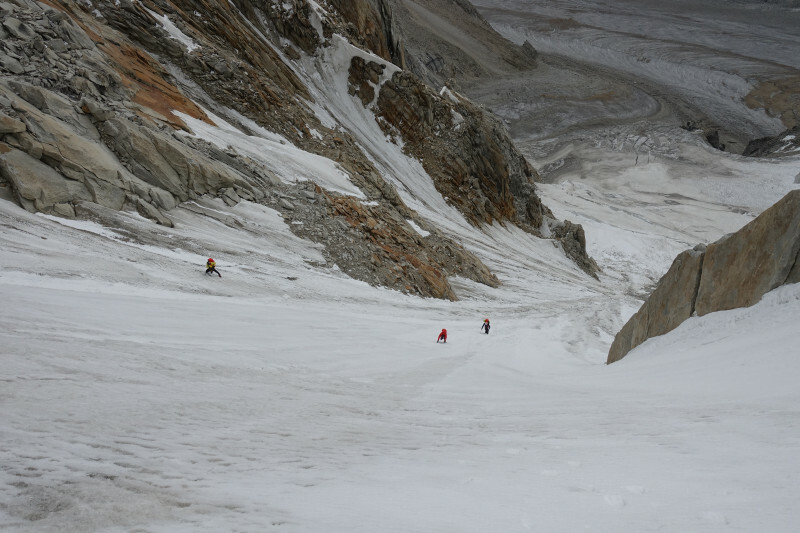 The beginning is called Panmah Kangri and is the shape of a pyramid of rock and ice. It is the 20th of August when Simon, Thomas, Yannick and Rainer march for a day in amongst scree and ice with the aim of setting up advanced base camp, at 5000 metres, on a pulpit which overlooks the valley. The alarm rings early at 2 am. Time to gobble down a frugal breakfast and it is time to set off again, silently, each one lost in their thoughts and in the cone of light their headlamps make. The ice face climbs up steeply, but the roped party advances quickly. Sunrise reaches a small snowy plateau, one of those corners of the world which is out of this world in which Nature speaks to you with a clear and imperious voice made of light and wind, and imposing on you marvel and to bend your head, just like, if not more, a religious ceremony. A long traverse on perfect granite, metre after metre, from west to south-east, and the route towards the peak is clear. It is 8 am when the four shake hands and hug on top of the six thousand metre peak of Panmah Kangri, and their ascent becomes the third that history can remember. The second step of this progressive game is Latok III, sister peak of the expedition’s objective. But Nature has differing opinions: the window of high pressure and the air as clear as glass ends abruptly, unleashing three weeks of wind and snow. But the snow on the cornices continue to increase, just like the frequency of avalanches, which is the only voice to play a duet with the wind. Simon and Thomas are ready, but the mountains are not. And a good alpinist has to know when to listen to that voice, has to be able to understand when it is time to say enough, what threshold of risk is acceptable to cross over. Especially if at home your wife and kids are waiting for you. Base camp is dismantled. Even this year it didn’t happen. This is not something sad: not going back home is sad, just as it is to go back in a zinc casket. Heading back home after such a decision, after accepting that you haven’t made your dreams come true, or at least not yet, can be a bitter pill to swallow. But it is also a promise, and it is an open door to the future. Going back home with a dream yet to come true and a new solid friendship is never a sad thing. To have ambitious dreams and make them come true is difficult. But there is something even more difficult: to have ambitious dreams and not make them come true.